We're a few months into the 2017-18 hockey season and I thought we should do some sort of Johnstown Tomahawks' alumni post to keep everyone updated on players that have moved on from their careers in Johnstown. For this alumni report we'll be focusing on the five players that are having great seasons so far this year in the college ranks. Most likely sometime next week we'll do another alumni post focusing on all former Tomahawks' players that are now playing pro hockey all over the world, which, if you didn't know, includes a handful of players. So let's get started. Agree with the list? Think we missed someone? Leave a comment here on the blog or on our Facebook, Twitter, or Instagram pages. Ryan Bednard played one season for the Johnstown Tomahawks back in the 2014-2015 season. For Johnstown, he appeared in 37 games and posted a record of 16-16-5 with a save percentage of .913. He had one shutout for Johnstown as well. Bednard is the first Tomahawks' player, and only player so far, to be taken in the NHL draft. Bednard was selected by the Florida Panthers during the 7th round of the 2015 NHL Entry Draft. 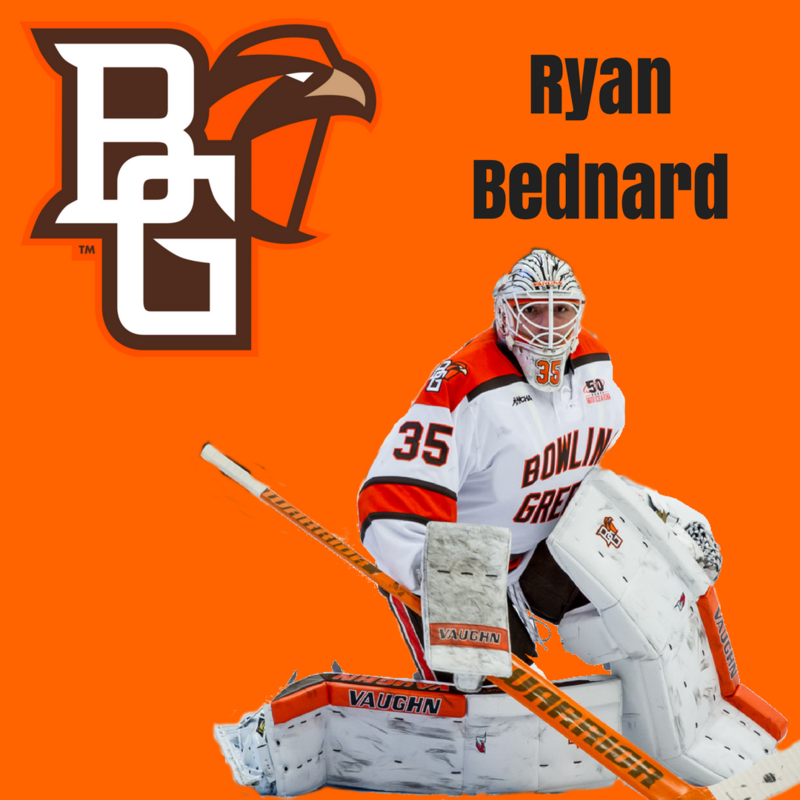 Bednard is currently in his second full season with Bowling Green State University. Last season he played in seven games for the Falcons and posted a record of 4-3-0 and a .882 save percentage. This year, he's played in 11 games and has a record of 3-2-4 with an impressive save percentage of .927. He is currently the team's starting goalie. Among Tomahawks' goalie alumni, Bednard has the second best save percentage this season. 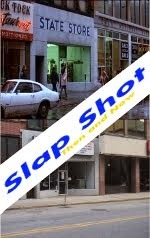 The first? That player will be making an appearance on this list as well, further below. Jordan Watt played two season with the Johnstown Tomahawks, during the team's first two season in Johnstown. Watt was a top goalscorer for Johnstown both season. In 2012-13 season, Watt was third on team in points with 37 (20 goals, 17 assists). The following year, 2013-2014 he was fifth in scoring with 34 points (22 goals, 12 assists). Watt is currently in his third college hockey season, second at Stevenson University after transfering from Neumann college after his first year. Watt had to sit out the 2014-2015 season due to NCAA rules, as he had played in 11 game for Victoriaville Tigres of the QMJHL, a Major-Junior hockey league based in Canada. In one season at Neumann college, Watt played in 10 games and had five points (three goals, two assists). 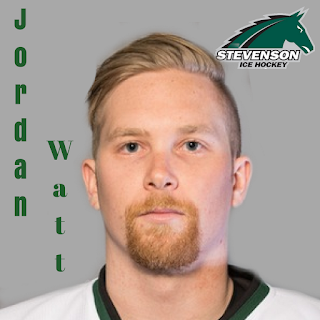 Last year, in his first season at Stevenson University, Watt appeared in 26 games and scored 17 points (nine goals, eight assists). This year so far, Watt has played in ten games and is producing more than a point a game with 12 total (two goals, 10 assists). His 12 points is good enough to give him the lead in point totals on the team. Another impressive feat is that so far this season Jordan does not have a single penalty minute. 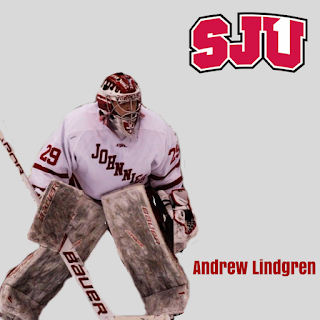 Andrew Lindgren is in his second year at St. John's University which is part of the Minnesota Intercollegiate Athletic Conference. Lindgren played one partial season for the Tomahawks during the 2015-16 season after he was aquried by the team from the MN Magicians. In 28 games, he had a record of 16-9-1 and a save percentage of .905, with two shutouts. He helped Johnstown qulifiy for the playoffs and got the team to the second round before being defeated by the Aston Rebels. Like Bednard, Lindgren has improved from his first year of college hockey. In his first year with St. John's, Andrew played in 11 games, as a backup goalie, and held a record of 4-4-2 - with a save percentage of .899. This year, he's played in six games, spliting time equally with his goaltending partner, and holds a record of 4-1-1. His current save percentage is .933 and he has one shutout on the season. His save percentage gives him the best out of all former Johnstown goalies playing this season in the college ranks. Trivia: Andrew's brother, Charlie Lindgren, has played in eight games this season for the NHL's Montreal Canadians. 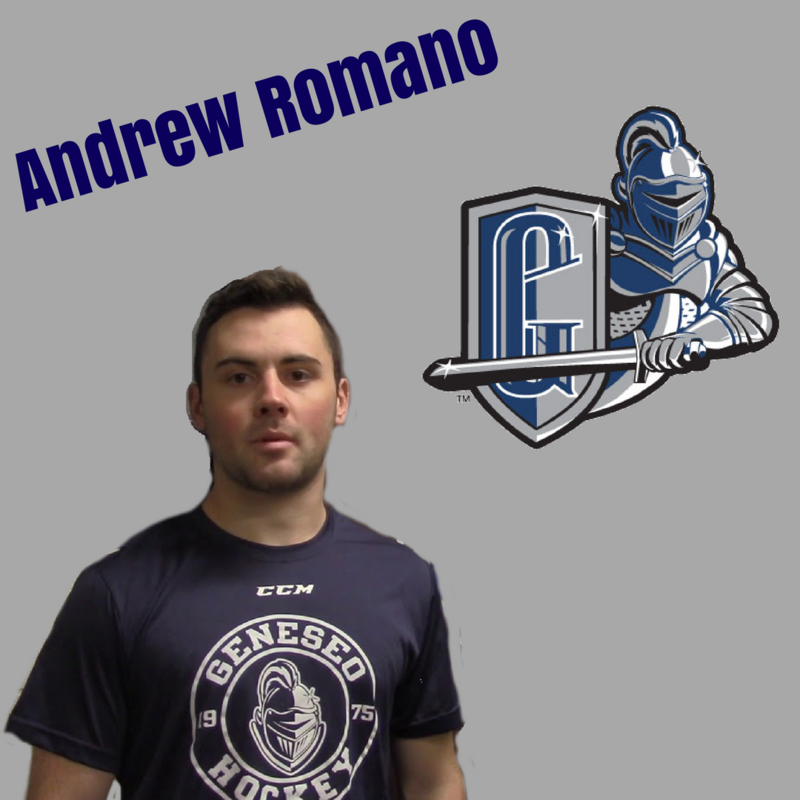 Andrew Romano was a fan favorite during his time in Johnstown, which spanned two full season (2014-2016). Romano is one of Johnstown's all-time top-point leaders, currently ranked third in team history having scored 80 points while a Tomahawk. 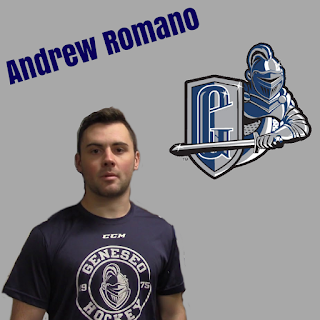 In his first season with Johnstown, Romano played in 58 games and scored 24 points (seven goals, 17 assists). The following year he tied for the team lead in scoring with 56 points (17 goals, 39 assists). During his second year with the Tomahawks, he was the team's ironman as he was the only player to play in all 60 games. Andrew has found the same success he had in Johnstown now playing for Suny-Geneseo. Last season, Romano scored 26 points (nine goals, 17 assists) in 27 games. This year, he's scored 14 points (one goal, 13 assists) in 11 games, which is currently second best on the team. Like Watt, Romano has shown perfect discipline, not having recorded a single penalty minute thus far. The Tomahawks currently have one former player who's been able to reach the ranks of the NHL and that's defensman, Casey Nelson. If I had to bet who I think might be someone that could get to that level some day, my money would be on Luke Lynch. Lynch played two season for the Johnstown Tomahawks and ranks just behind Andrew Romano on the all-time points list with 78 as a Tomahawk. In his first season with Johnstown, back in 2014-2015, Lynch scored 22 points (15 goals, seven assists) in 56 games. He also had 94 penalty minutes. The following year, Luke appeared in 57 games and had 56 points (29 goals, 27 assists) including 116 penalty minutes. With Johnstown, Luke could do it all. Hit, score, fight, which the fans loved him for. He's taken that game to the college D1 ranks and has had continued success there. 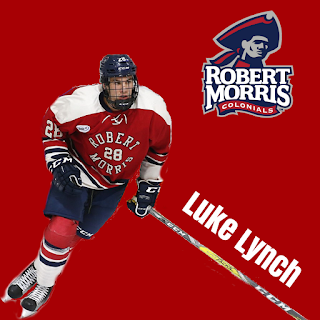 Last season with Robert Morris, Lynch played in 37 games and had 20 points (nine goals, 11 assists). This season he's become a point a game player, having 15 points (nine goals, six assists) in 15 games. He's also a +4. Trivia: Lynch's brother, Zac, who also played for Robert Morris, was a point or better player in his last three seasons at Robert Morris and is currently playing in the ECHL. In his pro career he has 28 AHL games of experience.